Royal Enfield 650 Twins have become so popular in the market thanks to the aggressive pricing. The design theme of both Interceptor 650 and Continental GT are different as former looks plain while the latter looks a bit more sporty. In this article, we have rendered Interceptor 650 with the fuel tank of Continental GT650. The GT650 fuel tank doesn’t look out of place in the Interceptor 650 and goes well with the overall design theme. The Continental GT 650 comes with 12.5 Litres of fuel tank while the one on Interceptor is 13.5 Litres. Both models are powered by newly developed 648 cc parallel twin cylinder, air and oil cooled, fuel injected engine. The power output is same on Interceptor 650 and Continental GT 650 as it produces 47 bhp of power at 7,250 rpm and 52 Nm of torque at 5,250 rpm. This engine is mated to a 6-speed gearbox and for the first time, Royal Enfield is offering both slipper and assist clutch. The GT 650 is lighter as tips the scale at 198 kg while the Interceptor at 202 kg. The performance of both motorcycles is really good and the mid-range punch is excellent as cruising in triple digital speed is easy as the engine doesn’t feel strained. The riding position on both motorcycles is different and the company has given rear foot pegs also. Royal Enfield has also given twin exhaust also. The braking power comes from 320 mm disc brake at the front and 240 mm disc at the rear. The company has given dual-channel ABS system as standard. Royal Enfield has 18-inch spoke wheels with 100/90 section tyre at the front and 130/70 section tyre at the rear. 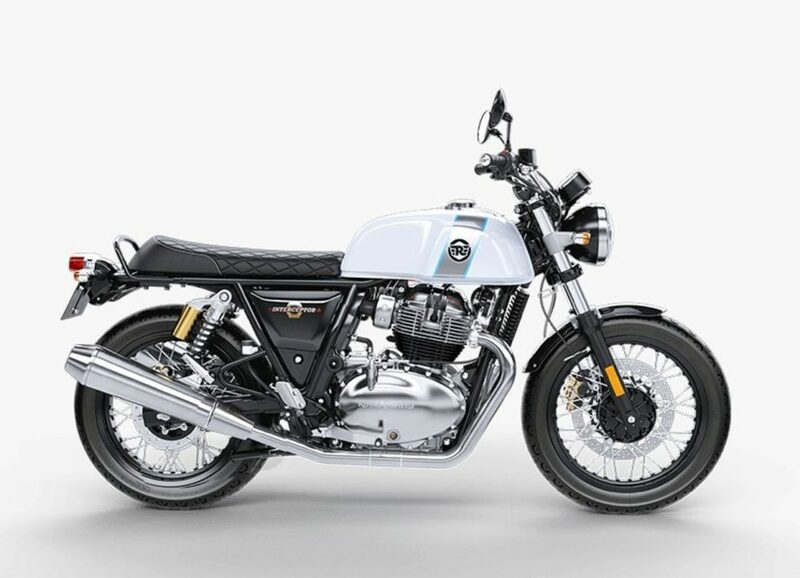 The 650 Twins come with 41 mm telescopic forks at the front and twin shocks at the rear. The Interceptor 650 is available in six colour options – Mark Three, Glitter & Dust, Orange Crush, Ravishing Red, Silver Spectre and Baker Express. The Continental GT 650 comes in five colour options – Black Magic, Ventura Blue, Mister Clean, Dr Mayhem and Ice Queen. The instrument cluster is basic as both speedometer and tachometer are analogue with a small digital screen for fuel gauge and odometer.